Eternal Orthodox Church calendar for the 10.02 year 2017. Ephrem died in 1096 A.D. He instituted the Feast of the Translation of the Relics of St. Nicholas to Bari, Italy. This feast is celebrated on May 9. Isaac was born in Nineveh and in his youth lived an ascetical life in the Monastery of Mar [Saint] Matthew in the proximity of Nineveh. When Isaac became known because of the sanctity of his life and of his many miracles, he was elected bishop of Nineveh and was forced to accept that rank. But, after only five months, he left the bishopric and secretly withdrew into the wilderness to the Monastery of Rabban Shabur. He complied many works of which about a hundred homilies on the spiritual life and asceticism, written primarily from his personal experience, have come down to us today. He was unequaled as a psychologist and as a director in the spiritual life. Even such saints as was St. Simeon [the New Stylite] of the Wonderful Mountain near Antioch sought counsel from him. Isaac died in extreme old age toward the end of the seventh century. Palladius was a great ascetic and miracle-worker. In front of his cell there appeared a corpse of a certain wealthy man whom robbers had killed and looted. When Palladius was brought to court and, in order to be spared from misery, he prayed to God and through prayer resurrected the dead man. He died in the fourth century. 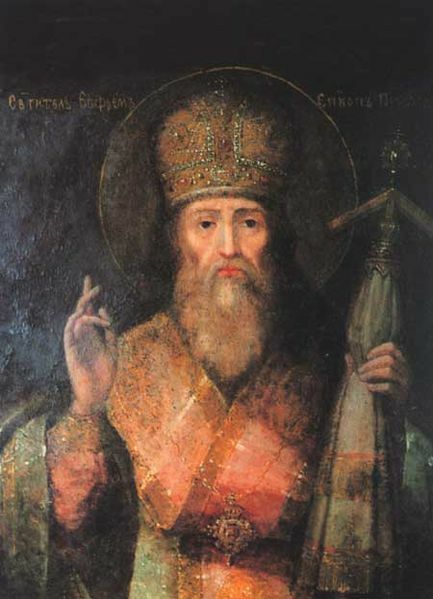 Saint Ephraim of Novy Torg, founder of the Sts Boris and Gleb monastery in the city of Novy Torg, was a native of Hungary. Together with his brothers, St Moses the Hungarian (July 26) and St George (in Hungarian “Sandor,” pronounced “Shandor”), he quit his native land, possibly because he was Orthodox. Having come to Russia, all three brothers entered into the service of the Rostov prince St Boris, son of St Vladimir (July 15). St Ephraim’s brother George also perished in the year 1015 at the River Alta, with holy Prince Boris. The murderers cut off his head, and took the gold medallion which he had received from St Boris. Moses managed to save himself by flight, and became a monk at the Kiev Caves monastery. St Ephraim, evidently in Rostov at this time, and arriving at the place of the murder, found the head of his brother and took it with him. Forsaking service at the princely court, St Ephraim withdrew to the River Tvertsa in order to lead a solitary monastic life. After several other monks settled near him, he founded a monastery in honor of the holy Passion-Bearers Boris and Gleb in the year 1038. The brethren chose him to lead them. Near the monastery, not far from a merchant’s road to Novgorod, a wanderer’s home was built, where the poor and travelers stayed for free. 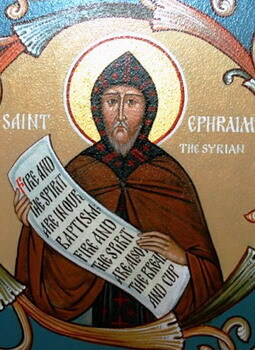 St Ephraim died in old age. His body was buried at the monastery he founded. The head of his brother, St George was also placed in the grave, in accordance with his last wishes. The relics of St Ephraim were uncovered in the year 1572. 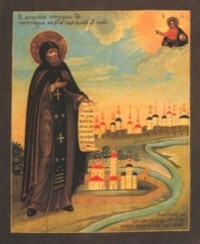 Saint Theodosius of Totma was born at Vologda about the year 1530. In his youth he was raised in a spirit of Christian piety and the fear of God. At the insistence of his parents he married, but family life did not turn him away from God. He went fervently to church and prayed at home, particularly at night. After the death of his parents and his wife, he withdrew to the Priluki monastery not far from Vologda. At the monastery Theodosius passed through the various obediences: he carried water, chopped fire-wood, milled flour and baked bread. He went to Totma on the igumen’s orders to search for a salt-works for the monastery. 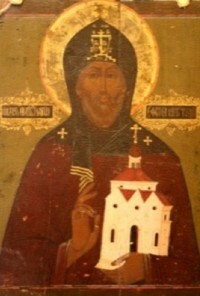 He sought the permission of Tsar Ivan Vasilevich and the blessing of Archbishop Nicander to found a monastery at Totma. Theodosius was appointed head of this newly-formed Totma monastery, which in a grant of 1554 was declared free of taxation. The saint founded the Totma Ephraimov wilderness monastery and brought brethren into it. Eventually becoming the head of two monasteries, Theodosius continued to lead an ascetic life. He wore down his body by wearing chains and a hairshirt, and beneath his monastic cowl he wore an iron cap. 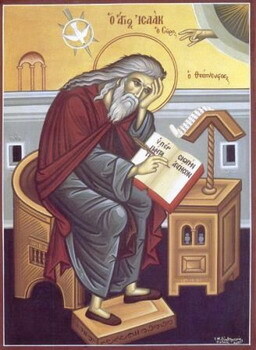 Fond of spiritual reading, he acquired many books for the monastery. St Theodosius reposed in the year 1568 and was buried in the monastery he founded, and miracles occurred at his grave. On September 2, 1796 during the reconstruction of the Ascension church, his relics were found incorrupt, and their glorification took place on January 28, 1798, on the day of his repose.